This Scottish single malt has matured in bourbon barrels and amontillado sherry casks. This single malt Tayne stems from the range The Legend. Each expression is carefully made by par Dr Bill Lumsden to respect the continuity of Glenmorangie distillery's history since 1843. This whisky refers to a Spanish galleon of the 16th century which lost treasures in the depths of the Tayne Firth, part of Glenmorangie legends. It is not its only link with Spain, indeed it aged in Amontillado sherry, after having aged in bourbon barrels. 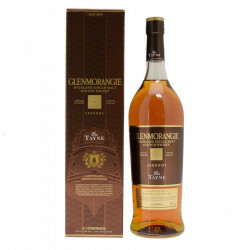 The Glenmorangie Tayne is a rich mahogany whisky showcasing a unique harmony of deep, scipy sherry cask notes, floral topnotes of rose petals and roast chesnuts, with a warming texture leading into rich sweet flavours of toffee, muscovado sugar and tropical fruits (mango, orange and peaches). Nose: flowery (rose) with grilled hazelnuts, caramel, apricots and nuts flavours. Then muscovado sugar taste, coffee and grape flavours appear. Palate: warm and oily texture turns into caramel, brown sugar, tropical fruits (peach, mango and orange), hazelnut and Brazil nut flavours. Finish: long and spicy with an bitter aftertaste of citruses and dry fruits.